How do you introduce yourself? If you are like me, it’s, “Hi, I’m Annie/Joe/Max’s Mom,” “Hi, I’m Sis. Mc.,” “Hi, I’m M’s wife,” “Hi, I’m Mrs. Mc.” When are you ever just YOU. When do I ever say, “Hi – my name’s Melissa.” I’ve forgotten what it’s like to be just Melissa. I have so many other characters, that Melissa is often pushed to the back of the closet. I was reminded this weekend that I AM MELISSA! My reunion with “my middle friends” pulled me out of my closet, put me on, and wore me out in public. Why are they “my middle friends?” Kelly Corrigan published a book called “The Middle Place” (I HIGHLY recommend it!!) where she describes the time between when you should be an adult (mortgage, children) – but at the same time – you are still someone’s daughter (a crisis where you need to call home). “My middle friends” are those who clearly know me independent of my parent’s home – but before I took on the rolls of Mrs. or Sis. or Mom. Those friends who were college roommates and “sisters” and rescuers and confidants. 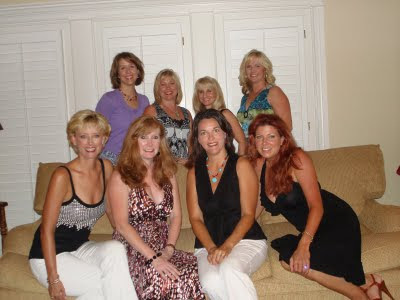 We were Kelly, Pam, Missy, Deb, Meredith, Shannon, Blair, Sue, Jill, and Betsy (just to name a few), without any prefix or suffix added to our name. Those who will remember the night one of us threw up in the study hall in the middle of finals, and had to be taken to the health center for an IV; those who will remember Fiji Island Princess; those who will remember the permanent designated driver with everyone’s car keys are her key chain; those who will remember the epic of the black boots – that will live on in the folklore of our collective memories forever. Things are parents or spouses or children may never know or ask about. My middle friends reunited this weekend. We are spread far and wide – Vegas, Atlanta, Arkansas, Texas, Oklahoma. We don’t see each other very often – but it is glorious when we do. We shared gifts and laughs and hugs – but most importantly we shared each other. We have one middle friend who was noticeably absent. She is suffering through stage 4 breast cancer and couldn’t travel. We heaved a collective sob to think she won’t be with us. We are young college co-eds, aren’t we? We aren’t old enough to be afflicted with life ending diseases? We can’t bear to think one of our middle friends being absent – missing her distinct voice, her love for the Denver Broncos or her pink lipstick. My middle friends were a welcomed tonic for my troubled soul. It has been a tough summer for “Annie’s Mom” – but they showed me that Melissa is alive and well, and will be able to endure through even the toughest times. Because that’s what middle friends do – and that is what they are there for – to come to your rescue and make you believe in yourself again – and remind you that MELISSA is the best thing you can be! I know what you mean. Me by my maiden name often seems to be a different person than the me that took my husband's name. It is such a blessing to share with people who have loved you for 20 years and can't shrug you off now! PS I love MELISSA, she is way cool. I read this post a few weeks back but I didn't watch the video...I just watched the video and I've got a bit of an ugly cry going on. (this happens more frequently after losing my mom) If the book is as good as the essay I'm going to love it. Thanks for sharing this video.